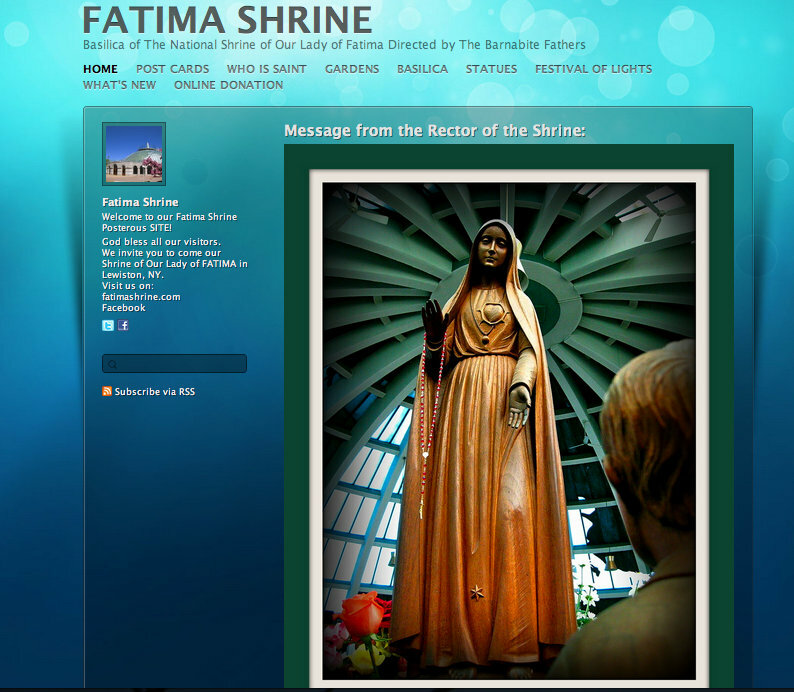 Welcome to Our Lady of Fatima Shrine Photo Blog! Fatima is the name of a small town north of Lisbon, Portugal. There, in 1917, Our Lady appeared to three little shepherds: Lucia, and her two cousins, Jacinta and Francisco (now Blessed Jacinta and Blessed Francisco) - then, seven and eight years old. The “Beautiful Lady dressed in white and more brilliant than the sun”, asked for prayers and sacrifice, so that “ Our Lord may save humanity from all calamities and bring peace to the world..."
A prayerful life consists of doing everything in God, with God, and for God. She emphasized a daily simple formula of paying called the Rosary, during which one reflects upon God's personal love for us. She stressed the fulfillment of one's daily duty according to the Gospel principles. This is the Fatima message and makes Fatima one of the 20th Century’s most pressing heavenly Invitations to an authentic Christian life. 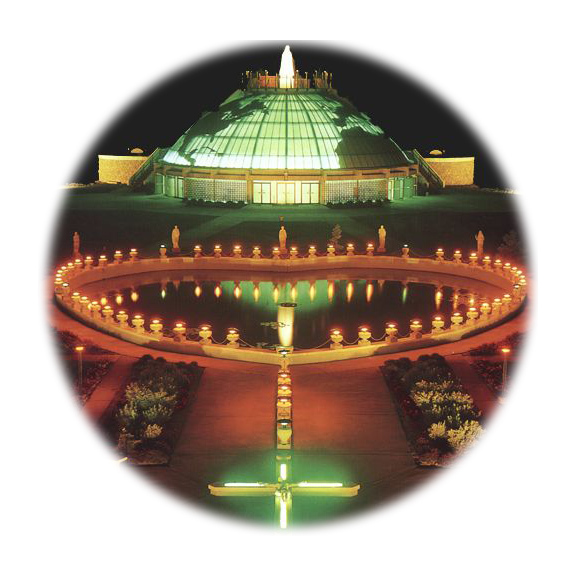 In 1954, the Barnabite Fathers, newly arrived from Italy, conceived the idea of offering to their new country a devotional center in honor of Our Lady, where people could come and be refreshed. Fatima U.SA. was therefore born, and the Barnabites became the promoters of the Gospel message urged by our Blessed Mother at Fatima, Portugal. The idea was enthusiastically accepted and fostered. Many people made our dream possible by their generosity and their dedication. First among the Shrine benefactors were Mr. & Mrs. Walter Ciurzak. In 1954, they donated 16 acres of their farm land and with God’s help and the support of many, the Shrine has slowly become what it Is today. Thousands of people are the beneficiaries of the peaceful and sacred surroundings of Our Lady of Fatima Shrine. The Peace Mural has been safely moved to the Relic Gallery which is not yet open to the public. When the new area is completed the Mural will again be available for all to see. The Mural by Professor Joseph Slawinski is 24 feet across the front, 7!6 feet wide and stands 5 feet from the floor. The left side shows the consequences of a lack of peace. A horrible aftermath of an atomic bomb mushroom hovers above spectral figures, clad in death white. The right side instead depicts Professor Slawinski’s fanciful projection of a tranquil world with laughing children and cosmic harmony. It is a scene of plenty, culture and education with inter-planetary travel and peace among the people of the world. When peace prevails, the earth is a joyous place. In the center of the Mural stands a pregnant young woman. She is a symbol that peace is not yet here, but its possibility is present. Surrounding her are four figures representing the four races of the world. Positioned above them is the symbol of the Holy Trinity drawing together the two hemispheres. Professor Joseph Slawinski has produced a unique type of art work known as “SGRAFFITO”. Sgraffito is a form of mural decoration that predates even formal architecture itself. The art was employed to add a modicum of beauty to the Etruscan tombs and the catacombs of ancient Rome using only the two colors of black and white. Professor Slawinski has pioneered the use of additional color in sgraffito by adding pigment to cement. His work graces more than 150 churches, theaters, palaces and homes in his native country of Poland. First, the artist does a full length painting, called a cartoon, in the same proportions as the mural he plans to do. He then traces the outline of the painting on heavy transparent paper. After this, the paper is perforated and is laid over the mural area, which has been previously layered with four coats of pigment cement: black, red, yellow, and silver-gray. A fine charcoal dust is poured over the paper. It filters through the perforations and leaves an outline for the artist to follow with chisel-like tools until he reaches the desired color. The process is particularly suited for murals of a religious, historic, or ornamental nature. “The art is capable of producing an inspiring spiritual feeling,” Professor Slawinski has said. Thousands of pilgrims coming every year to visit our Shrine are inspired in their search for peace through this masterpiece. The Mural is made possible by many concerned people who, with their contributions, are providing the necessary funds.